With the death of the Guitar Hero and DJ Hero series and Harmonix being let go by MTV Games, we’re currently seeing the demise of the music-game genre. Or at least the musical-instrument genre – dancing seems to have stepped up to at least partially fill the void. All of which makes Ubisoft’s sudden entrance into the instrument genre, due for this September, even more unexpected – but more on that later. Only 3 years ago, the music game genre was booming. In fact its success was so remarkable that, in a record year for games sales overall, the rise of the music genre seemed to be most responsible for a bumper 2008. Guitar Hero and RockBand were the two titles underpinning the music genre so with the former now gone people are naturally asking if, and how, Rock Band can survive. Harmonix themselves have been teasing an announcement at the forthcoming E3 but the hints have been pointing at either new IP and/or a use of motion controllers. 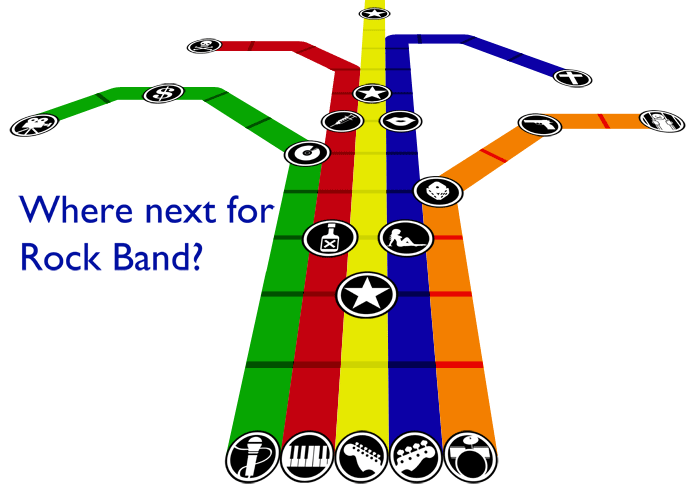 So is Rock Band quietly going to slip into the background of Harmonix’s lineup?